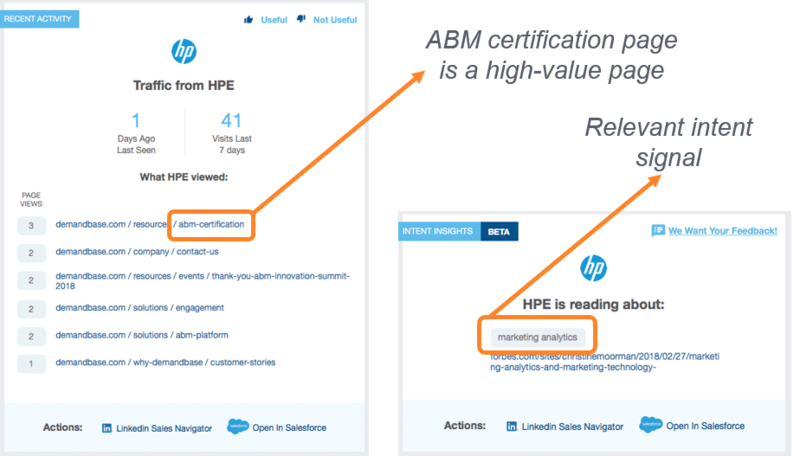 Marketing activities alone aren’t enough to deliver on the full potential of ABM. Marketers also need to deliver programs that help Sales push deals forward in order to achieve pipeline and revenue goals. Segmenting out target accounts, executing successful advertising and website campaigns, and building awareness across a buying committee are all important – but not enough. Sales teams ultimately need insights on target accounts and decision makers to influence prioritize their efforts, personalize their outreach and increase their close rates. A truly successful ABM program requires Sales to close the loop on targeting and engagement efforts and push deals forward. The Demandbase Conversion Solution provides the data and insights that Sales needs to better understand and target the right individuals, with personalized messages, within your target accounts. Identifying the key individuals within target accounts, including contact information. Understanding context and relevant insights about each individual. 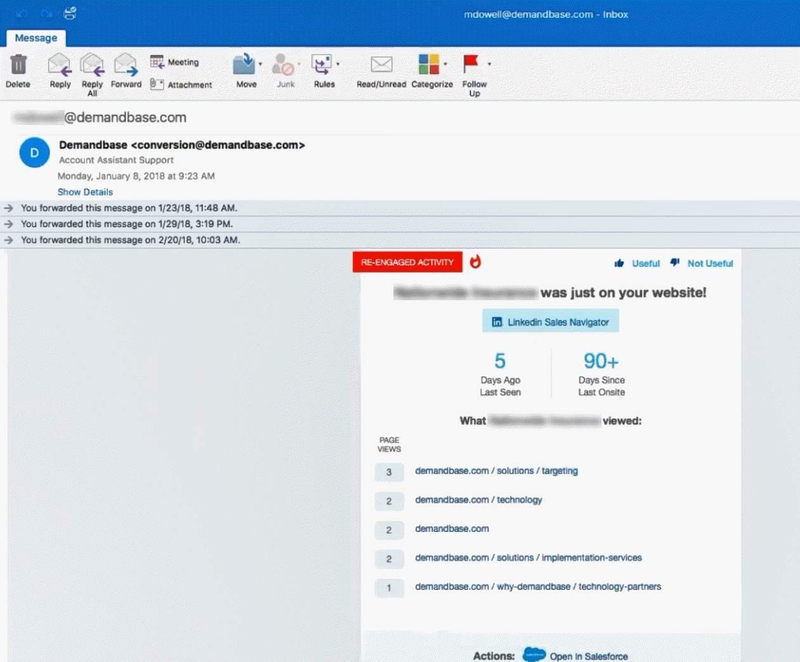 Personalizing outreach to maximize the quality of sales conversations in real time through the productivity tools they use every day including email, Salesforce, Slack, and LinkedIn Sales Navigator. 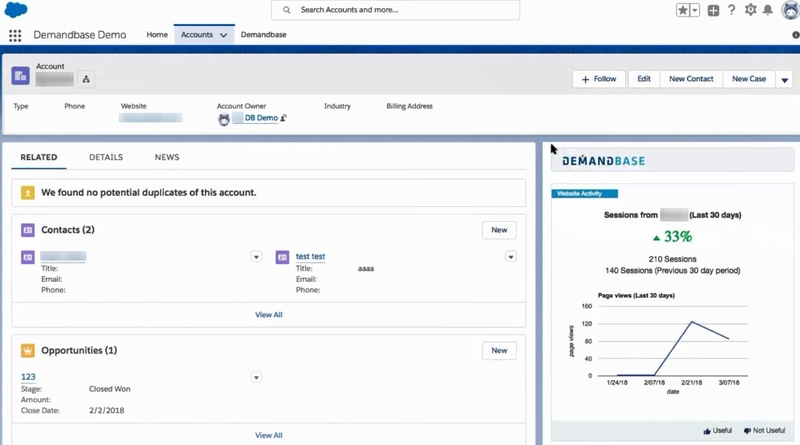 Demandbase Conversion delivers account-based insights directly to your Sales team, helping them close deals faster. It uses AI to surface the insights you need to better understand and target the right individuals,with personalized messages, within your target accounts. The insights are delivered right where Sales users want them—in email, Slack, or Salesforce. 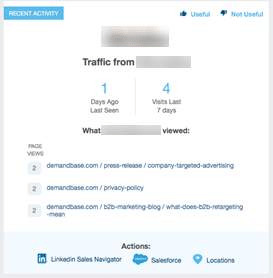 Similar to the rest of the Demandbase ABM Platform, Conversion starts with building out your custom profile, telling the platform about your ideal customers, your existing customers, common job titles, keywords, and more. The insights sales teams receive allow them to prioritize their outreach based on the level of intent and interest of their target accounts. The insights are directly linked to the target accounts they own in Salesforce allowing them to focus only on those accounts that mean the most to them. 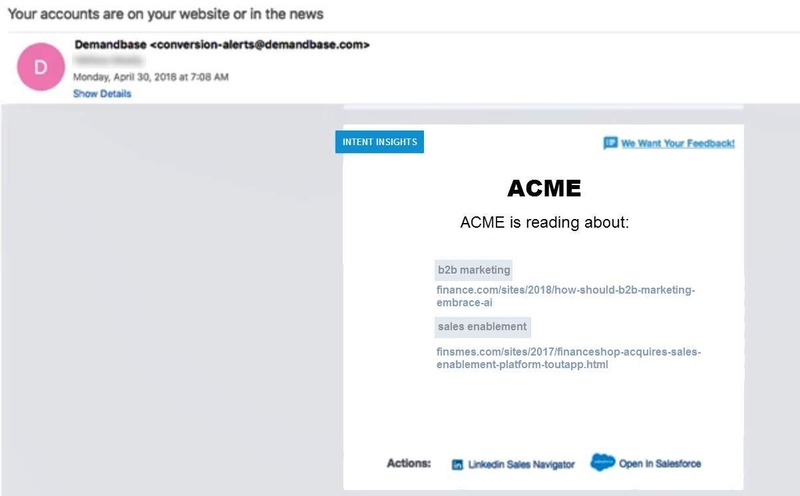 The Demandbase Conversion Solution integrates with Email, Salesforce Sales Cloud, Slack and LinkedIn Sales Navigator to make it easier for sales teams to automatically receive insights and reach out to target accounts using the tools they access most. Sales reps can customize the notifications so that you only receive notifications from the accounts they want to focus on the most. 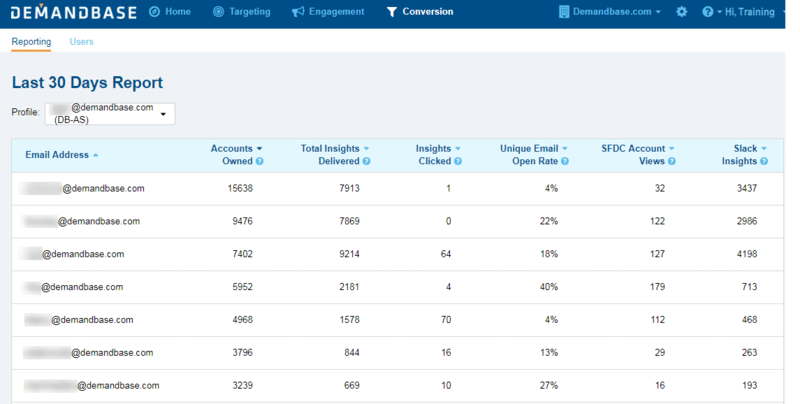 Intent Insights let you see what your target accounts are reading and researching as it pertains to relevant Demandbase key words. Click the links under each key word to review articles that will help you develop relevant talking tracks. You can open Salesforce and LinkedIn Sales Navigator to find additional information about this target account as well as research new contacts. Re-engaged Activity Insights alert you when a target account re-engages with your website after a long absence. This type of insight shows the number of days since the target account last visited your website, how many days since their most recent activity, and the pages they are most interested in. Based on this information, you can conduct further research for this target account by opening the Salesforce and LinkedIn Sales Navigator links to find relevant contacts to reach out to with your personalized messages. You receive Recent Insights when an account has visited your web site within the last seven days. Click the links to view the web pages this account has been reading which will help you develop relevant talking tracks and determine if specific high-value pages were visited. You can open Salesforce and LinkedIn Sales Navigator to find additional information about this target account as well as research new contacts. You can also click the Locations link to view where this target account is located which will help you to focus your search for contacts in that metro region listed. Accounts News Insights provide you with links to relevant news articles or blog posts a target account is reading or is a part of. You can read the content in the articles to find relevant talking points and tailor your messaging around current events. 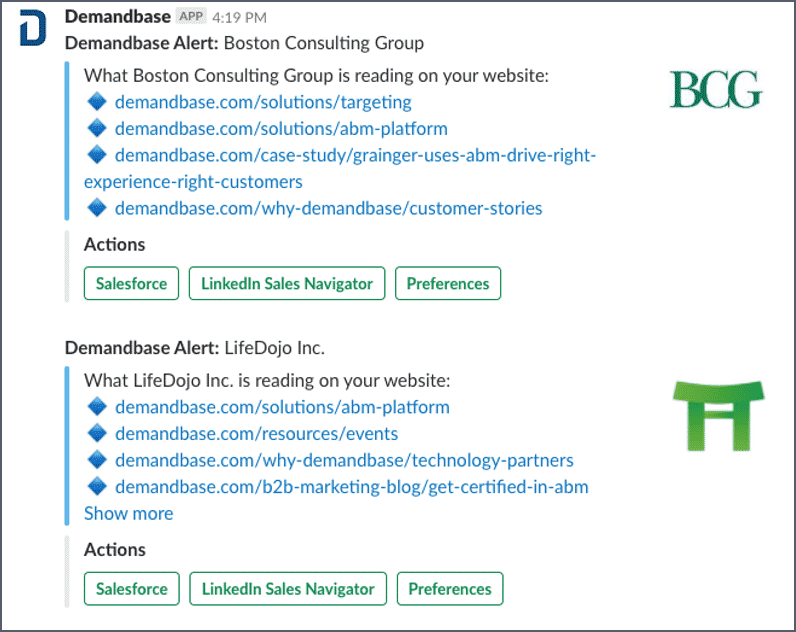 Slack Insights are real-time notifications that alert you when your target accounts are actively visiting your company's website. This type of insight includes the account name and links to the specific pages they are visiting. 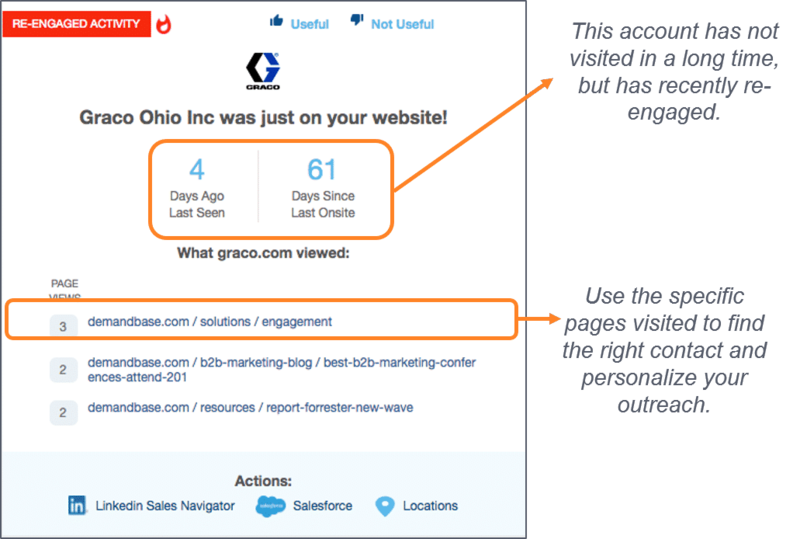 Based on the pages they are researching, you can take immediate action by opening Salesforce or LinkedIn Sales Navigator and reaching out with personalized messages to contacts you find at each account. 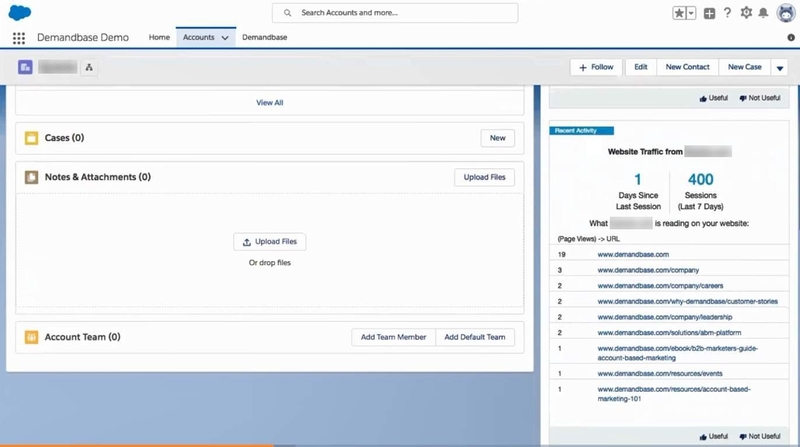 Salesforce allows you to to view recent activity for each of your target accounts in the Lightning and Classic versions of Salesforce. Website Activity Insights give you an overview of how many sessions a target account has had at your website over the last 30 days, the number of pages viewed, and the percent increase or decrease in their activity. You can use this information to prioritize the accounts you reach out to. Recent Activity Insights show you the number of days since the target account last visited your site, how many days since their most recent activity, and the web pages they are most interested in. This type of insight helps you prioritize and personalize your outreach to those target accounts that are showing the highest intent and activity. The Website Traffic Trends Report shows you website activity for all of your accounts. You can see which accounts are actively visiting your company's website, by day, week, month and quarter. You can also view which accounts your company is spending advertising dollars on. This report let's you see upward activity trends across all accounts which helps you prioritize the accounts you should focus on. 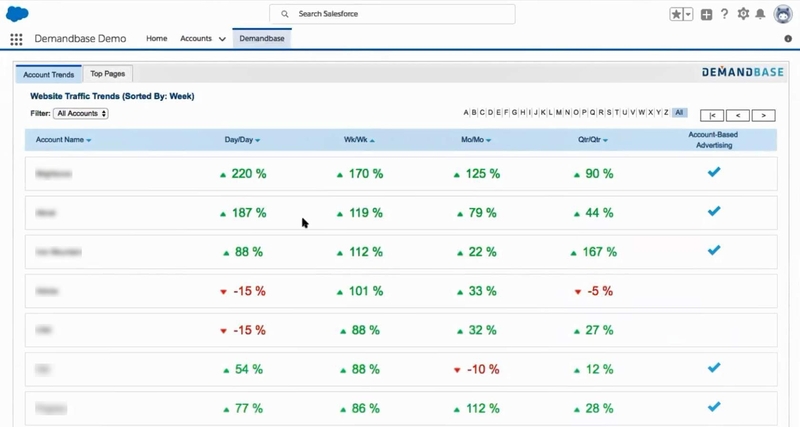 Use the Last 30 Days Report to track your team's usage of Demandbase Conversion insights. You can access reporting in the Conversion area of the ABM Platform to track the monthly activity of your sales reps. This report is helpful to verify that your sales teams are receiving insights and using them productively. Use these best practices to get the most out of Demandbase Conversion. Prioritize your accounts by focusing on accounts that are visiting your web site’s high-value pages, or reading and researching topics that are relevant to your business. Discover new contacts by leveraging the details from a website activity insight or an intent insight to help you build out the entire buying committee at your target accounts. You do this by reviewing the specific web pages this target account has visited to learn more about what this account is researching and reading about. Once this information is gathered, you can leverage it to find new contacts in LinkedIn Sales Navigator. You can also learn more about where the website visits came from by clicking the Locations link. A Re-engaged Activity Insight is particularly valuable because it indicates that a target account that has not visited your web site in some time has returned, and is engaging in a meaningful way. 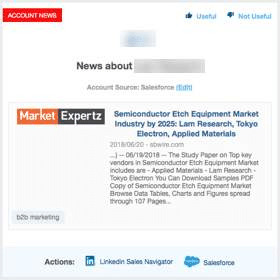 Use the specific pages visited to find the right contact in LinkedIn Sales Navigator or Salesforce and personalize your outreach as soon as you receive one of these insights. Click the Locations link to view more specifics about global traffic included in the insight including: Metro Region, web page visited and date visited. Use this information to prioritize your outreach to contacts in the regions listed. To learn more about the Conversion Solution see the Conversion FAQs.